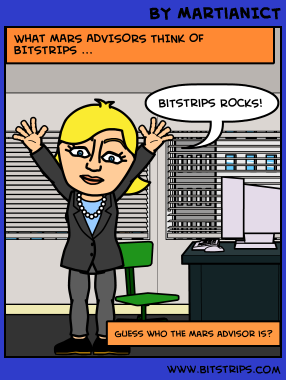 Bitstrips for Schools a HIT! Recently, one of my digital media clients was featured in the Globe and Mail. Bitstrips is an online comic book that is created by the you, the user. Their free online toys make it fast, fun and easy to create awesome comics with any character, including you and your friends! I created this comic in under 10 minutes and in case you haven’t met me… I actually kinda look like that! While the free site is awesome, what Bitstrips created in their Bitstrips for Schools site is even better. They have created a tool for teachers that enables them to engage students in a creative manner using digital media while promoting reading, writing and media literacy. This is an exciting way for students to acquire much needed literacy in a medium they understand and enjoy. Ontario’s Ministry of Education has licensed Bitstrips for Schools for all publicly funded schools, first nations schools using the Ontario Curriculum, OISE and Faculties of Education at Ontario universities. In the first five weeks over 75,000 Ontario students under the guidance of over 5,000 teachers have created over 100,000 comics. This program is in response to studies showing that graphic knowledge and comic strips are an essential literacy tool, especially for boys. This tool allows the imagination to run wild with easy-to-use graphic tools at your fingertips! Imagine, create and publish online! There is an integrated student/class management system that simplifies the sharing of ideas within a classroom. Bitstrips is a company to watch!